Woe is me, the pain and degradation in 19th century women’s literature! The anger, frustration and solitude!! 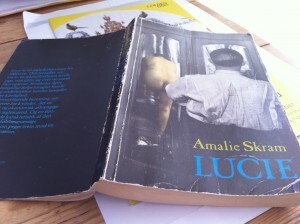 I just spent the last couple of days reading a book by Amalie Skram called ‘Lucie’. Recalling some of the passages still sends shivers down my spine. It is a story of society, marriage and the bonds that are being put on both sexes (but in all honestly, it’s mostly women who bear the heavier judgmental shackles). Lucie is what you may call a fallen woman, one who has let herself be romanced into a relationship before marriage that results in a child who dies at an early age. In the beginning of the novel she manages so fortunately to marry up in society to a Mr. Theodor Gerner, attorney. And while optimists would have liked this to be a happy-go-lucky situation for our girl here, she soon finds out that marrying Gerner is not all sunshine and cream cakes, far from it. Instead of putting her past behind them, Gerner ends up being a jealous husband who sees it as his role as a man and husband to educate, save and punish Lucie like an ill-behaved child who has had her hand too many a time in the man-jar. If only she would not stand up to him, answering rudely like this morning. Resentment flushed his face red. This had to be dealt with in all strictness, uprooted; she had to learn, once and for all, that this was not proper behavior. Was this the kind of gratitude she owed him? No, she had to apologize, he would not tolerate being berated by her. He would make her aware of what she had done. Of course, he would forgive her, but first she had to be punished resoundingly. … and the palpitations she got when she heard him coming home, or when she just sat there waiting for him. In the end she had thought that she saw ghosts in the corners and black shadows everywhere, creeping around her. And when he sat there silently it was like his silence whooshed in her ears and filled her with fear. Oh, the kind that made her want to kill herself out of sheer fear. And it was not until she went to him, crawling on her knees, begging and crying like a madman, that he pardoned her. It was always like that. Not until then did her pardon her. Oh how he had broken her – he was strong, the fellow, and he would not budge. Not even if his life depended on it would he budge. Now he had gotten what he wanted; she was on tenterhooks all the time and was so afraid of him that she would shiver all over simply if he looked at her. He had succeeded in civilizing her, and he probably thought it was all well and done with, because now he was merciful and gentle with her. If only he knew how angry and bitter she was with him. Every once in a while she thought that she desired to kill him just to get back at him. She wished to God she had never known or seen him. Both Theodor and Lucie are victims of societal norms that destroy both of them. She hopes for a leg up in society, to be respectable, liked, loved and feel secure. He hopes for love, properness and the chance to reform a ‘lost’ soul. Whatever their reasons for marrying are, the novel makes a model of a critique in Scandinavia in the 1880’s that has become known as ‘sædelighedsfejden’ – a battle of morality against the contemporary society that held women in a prudish role, repressing their desires to express/live their sexuality and granting a free-pass for men to do and go as they pleased, in and out of wedlock. It is a strife within a society built up on double standards. Many others like Amalie Skram voiced their critique in letters, novels, plays and art, amongst which probably the most famous is Norwegian playwright, Henrik Ibsen, who set up the play ‘Et dukkehjem’ in 1879 in Copenhagen. Lucie is an important piece of literature in the sense that the voice of a societal outcast is being portrayed, taken out in to public and given a voice. Even though her situation is dramatic and tragic to the core and pessimism is dripping off the pages, it also offers some insight and a chance to say, ‘this must be changed, the outrageous situation is not viable in our society’. And hopefully, this will continue to stir people’s minds, make them think and, most importantly, act. Far og les “Penger” hjá Victoria Benedictsson, hon er um sama tema og sera áhugaverd.